There are only three products that I consistently and unfailingly repeat buy: Dermalogica Daily Microfoliant, L’Oreal Exfotonic and Prescriptives Flawless Skin Concealer. Those of you in the know will have made a pained ‘ssstttttttttt’ noise at that last one. 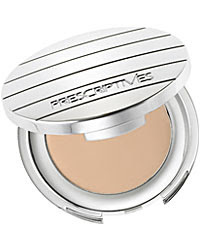 Yep, Prescriptives, bestower of my mostly-convincing, fake-flawless complexion, is going out of business. Or rather, parent brand, Estée Lauder, is closing it down. This is old news, announced months ago, but January is the last month the brand will be available to buy. I heard on the grapevine (aka my mum told me) about a little something called 50% off in House of Fraser stores starting Boxing Day. Being a cunning sort, I set out to befriend the (fittingly named) Laura, who works on the Prescriptives counter in Cavendish House, Cheltenham. Due to my albino-self requiring the palest shade, ‘Level 1, Warm’, I’d already sent mum in to panic-buy me a full-pricer before Christmas, which is when she’d sussed out the sale. In other words, she’d laid the groundwork. When we sidled back in, all familiar, lovely Laura recognised Mummy Wheat and offered to put some stock by for me. ‘How many of the Flawless Skin do you want? ‘All of them.’ Which sounded pretty rock ‘n’ roll, but turned out to be three. Still, three for £8 each instead of £16? I’ll throw in an Instant Gratification Skin Renewel Peel as well then; don’t mind if I do. 1. The shade. The fact it comes in warm or cool tones is simple, yet genius. I don’t know why more brands don’t do it. 2. The coverage. It’s dense without being cakey. It covers spots, open pores and redness, but it’s barely detectable on the skin. 4. Staying power. If you apply this and set it with a bit of powder (I often just use bronzer) it stays on brilliantly, requiring only minor touch-ups. 5. The packaging. A smart silver compact with a mirror in the lid. 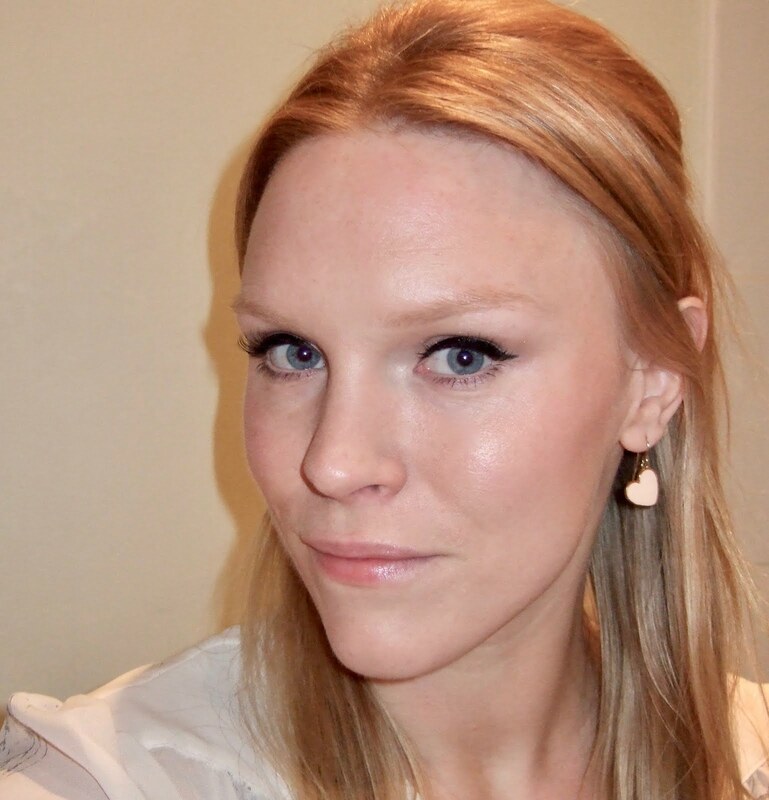 Simple enough but so many brands' concealers fall short (I’m looking at you Bobbi Brown). My only grumble is that the silver comes off eventually, leaving bits of ‘glitter’ on my face. So there you have it. If you already use Flawless Skin I know you’ll be gutted like me and hoping for a fitting replacement to emerge in time, when the loss isn’t so fresh. If you don’t use it, I bet you want it now! House of Fraser online no longer has it, but try your nearest store because Cheltenham still have the colours the annoying albino girl didn’t buy. 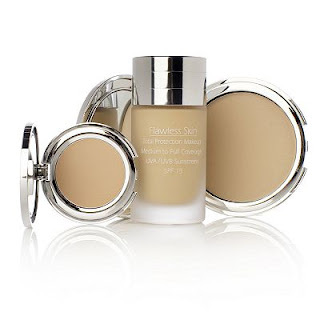 QVC have a 3 Piece Flawless Skin Collection available for £45.50, which contains the concealer, the Flawless Skin Foundation and Flawless Pressed Powder. If all else fails… try eBay. It’s a great place to get hold of sold-out products or discontinued stock. You have to be persistent though; save a search and have them email you when the product is listed. I’m sorry to blog so enthusiastically about a product you might not be able to get hold of, but I had to write a little love letter to my Flawless Skin. Gutted about Prescriptives. I don't think any other line does foundation so well, but EL just weren't prepared to support/push the brand, and foundations just don't sell in the way that LE colour collections do - where the focus in the group is mostly on MAC and Bobbi Brown. I also worry for Origins - EL originally launched it to compete with the Aveda market, and now they have Aveda do they need Origins too, or is the customer overlap too great? Verrrrrry interesting. I don't use any Origins products that I can think of but I'd like to get some, plus the idea of any product line disappearing is disheartening. We'll be left with one big EL granny brand soon - all gold packaging and rose scents. Also, the time the woman at the Origins counter in Boots did that Peace of Mind stress buster on me was HEAVEN. Had to stop myself turning up there every day so she could rub my ears.